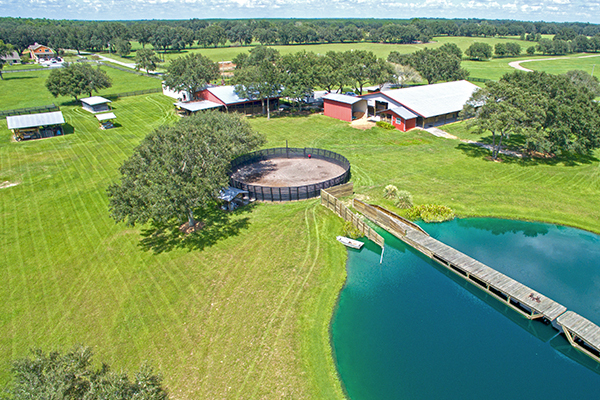 A pristine, picturesque equestrian facility located within Morriston, FL, Heartwood Haven is a true paradise for a multitude of disciplines. 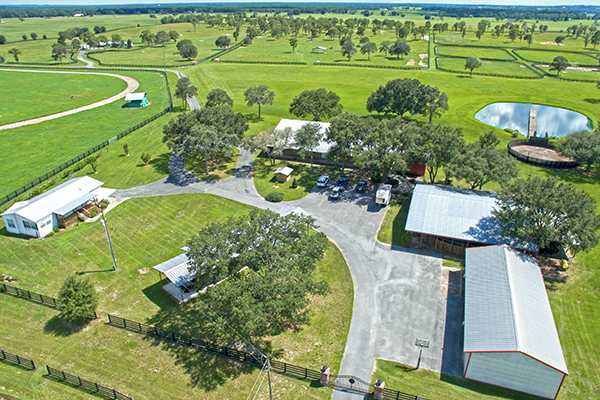 With a premier location just minutes from Ocala, Florida, and several equestrian venues, including HITS Post Time Farm, the upcoming World Equestrian Center, and much more, this facility is the perfect place to live an active equine lifestyle, as well as raise and train horses all year long. 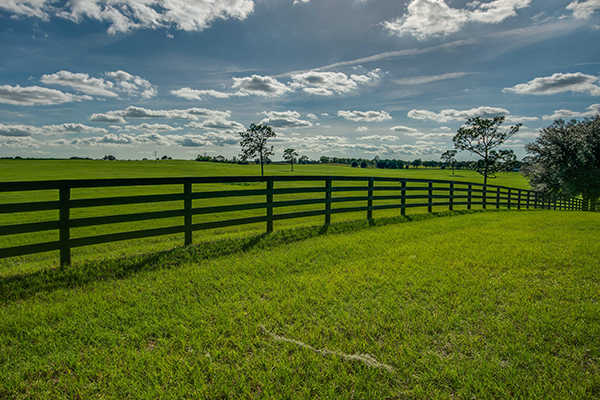 Central Florida has long been renowned as the Horse Capital of the World™, due in no small part to the mineral-rich soils, a favorable year-round climate, and rolling pastures that combine to make an ideal agricultural environment. Well-supported by an established network of equine services, including popular transportation companies, numerous tack and feed stores, farriers, world-class equine health-care, and more, equestrians will find that Ocala and the surrounding area are ideal for pursuing the next step in their equine ventures. 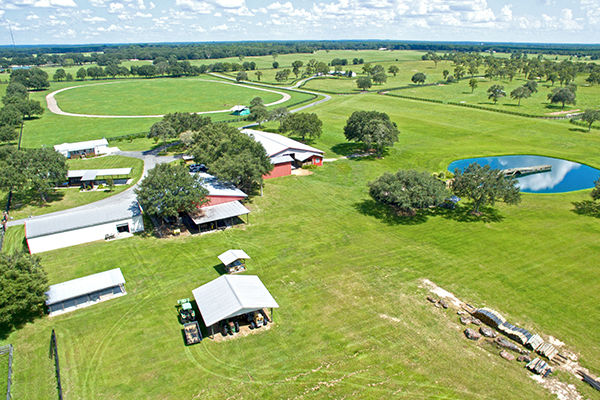 Spanning an impressive 180+ acres of Central Florida countryside, Heartwood Haven offers the perfect training facility. 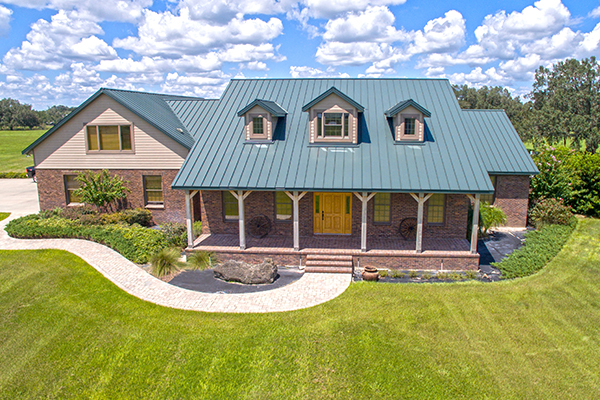 From the picture-perfect sunrises to the comfortable, custom home which rests centrally on the property, this farm is a truly special slice of equestrian paradise with so much to offer. 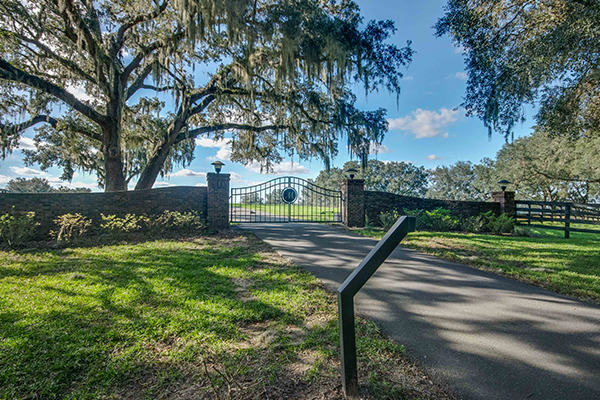 Dotted with oaks and offering gentle roll throughout the property, horses will be comfortable as they enjoy Florida sun and lush pastures all year round. Heartwood Haven’s notable main residence is a modern farm home with a stunning country aesthetic. At 4,435 sq.ft., the 5-bedroom, 4-bath home is a spacious, inviting residence with ample space for day-to-day living. Heartwood pine floors and wooden accents run throughout the home, creating a warm and inviting ambience. 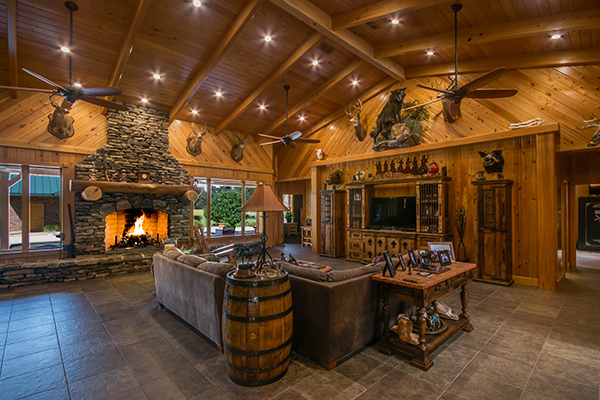 The main living area showcases soaring wood-beamed cathedral ceilings with ample lighting, as well as a custom stone fireplace for those cooler winter evenings inside. Overlooking the living area is the chef’s kitchen, which includes stainless steel appliances, expansive granite counters, and a wrap-around conversation bar. Private and indulgent, the master bedroom is the perfect place to rest your head after a long day. The en-suite includes a spa bath, walk-in shower, as well as his and hers vanities, making your morning prep a breeze, even for multiple people. The guest suite offers plenty of space, with an office, sitting area, and its own private bath. Adjoining the home is a 13-foot deep, heated salt-water pool and spa. Surrounded by a concrete deck, there’s plenty of space for hosting your next get-together, sun-bathing, or setting up your own summer kitchen. Overlooking this pool area is a separate pool house, which could be used as an in-law suite if so preferred. This property includes several other smaller residences, which could be used for renting or additional farm help if desired. Heartwood Haven’s facility is comprehensive for the modern equestrian. With the inclusion of a 1/2 mile dirt track, this property could be the perfect spot to train your next champion. The 10 paddocks, plus 8 smaller turn-outs are four-board fenced, well-maintained, and dotted with the shade of mature oak trees. 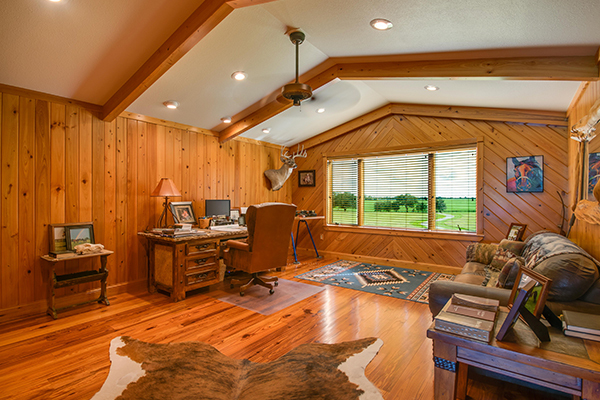 The center-aisle barn includes a total of 22-stalls, as well as an additional office space. Storage is no problem, with additional utility sheds, equipment barns, and tack and feed rooms. The equine pond is a unique feature of the property, providing horses a superior aerobic exercise without any of the stress on the tendons, ligaments, and muscles of the legs that traditional, weight-bearing on-the-ground exercises may create. Equine pools are also effective in helping an equine athlete recover from sour attitudes that some horses may develop over long periods of performance. With a dock that runs almost the full length of the pool, guiding your horse through the water is easy. Within Marion County, Florida, you’ll find Heartwood Haven’s location to be perfectly located to take advantage of Ocala’s well-supported equestrian community. 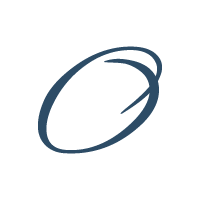 A perfect blend of rural and urban lifestyles, Ocala is just a short drive from Heartwood Haven’s extensive facilities. World-class veterinary hospitals, numerous feed and tack retailers, farriers, equine dentists, and major horse transportation companies are all readily available. Marion County also boasts a favorable climate suitable for year-round training, mineral-rich soils perfect for raising strong horses, and rolling pastures. 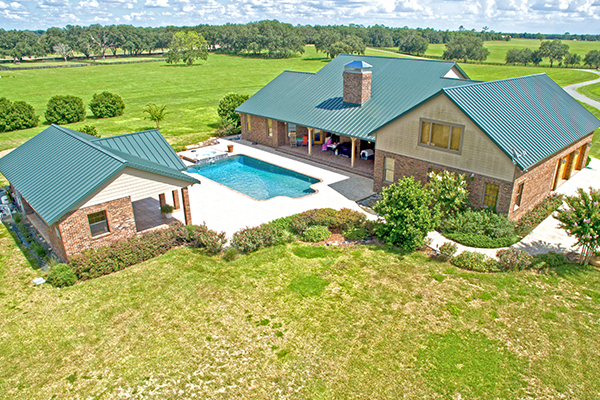 Located just minutes from the Ocala International Airport, this location also allows for premium horse transportation with minimal hassle. HITS Post Time Farm is a short drive from Heartwood Haven. Offering a multi-week, internationally recognized circuit, HITS Ocala Winter Circuit is the premier hunter-jumper exhibition in Central Florida. 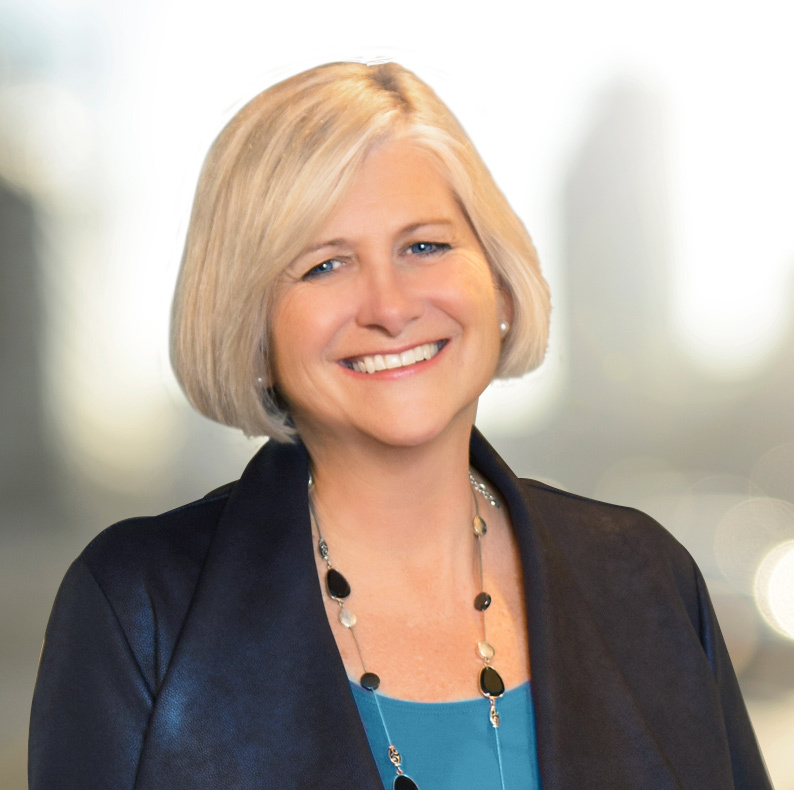 But it doesn’t end there– Heartwood Haven is also minutes from the upcoming World Equestrian Center, a meticulously designed 3,145-acre equestrian park that is currently slated to open in 2021. 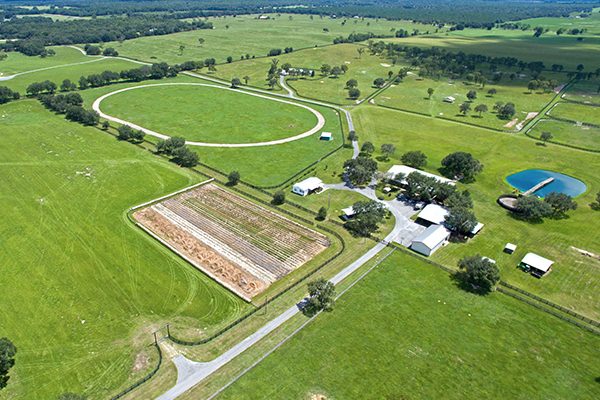 This facility aims provide a world-class equestrian sports venue adjacent to Golden Ocala Golf & Equestrian Club, all easily within reach of Heartwood Haven. Ocala also offers several other equestrian opportunities, including shows at the Florida Horse Park, exhibitions at Grand Oaks Resort & Museum, and numerous options for trail riding including the Florida Greenway & Trails, several state parks, and more. Ocala Breeders’ Sales is also just a short drive away from Heartwood Haven, allowing for the opportunity to attend and sell with minimal hassle. With several bloodstock auctions running throughout the year at the newly renovated facility, breeders have ample opportunity to sell yearlings, two-year-olds, and horses of racing age several times a year. With a long history of thoroughbred excellence based right here in Ocala, including 50+ National Champions, 6 Kentucky Derby winners, 7 Preakness Stakes Winners, 6 Belmont Stakes winners, 26 Breeders’ Cup champions, and 6 Horses of the Year, Marion County is the perfect place for those in the thoroughbred industry. Ranked second in the nation for foal production, 75% of Florida’s Thoroughbred Industry is located within Marion County. Just a short, scenic drive from Heartwood Haven puts you right at the heart of Gainesville, Florida, the home of the University of Florida. With a never-ending stream of available events, an expanded selection of shopping and dining options, Gainesville is sure to be a destination that residents won’t pass-up. 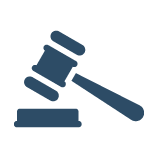 If you’re looking for an active night-life, Gainesville is exactly what you’re looking for! This 140 acre training facility is the pinnacle of equine training centers. 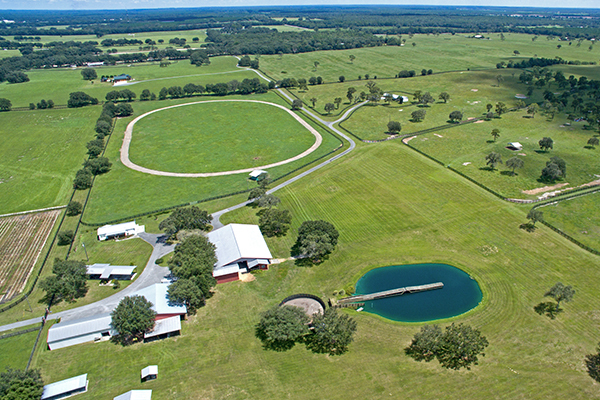 Facilities include a half mile gallop track, an equine pool, round pen, and eurocizer with lighting. 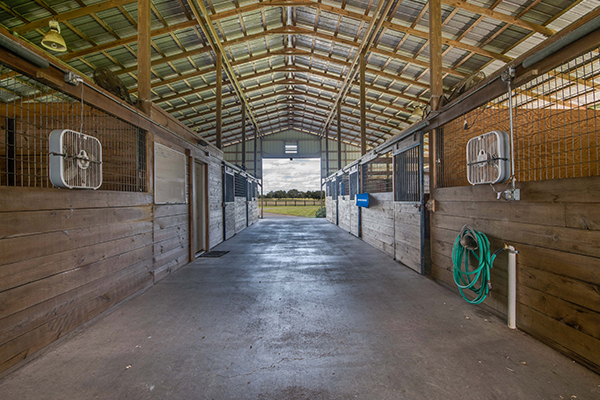 Center Aisle Barn, Equipment Barn, a total of 22 stalls with 14 paddocks. Heartwood Haven has incredible amenities that must be experienced firsthand to be truly appreciated. 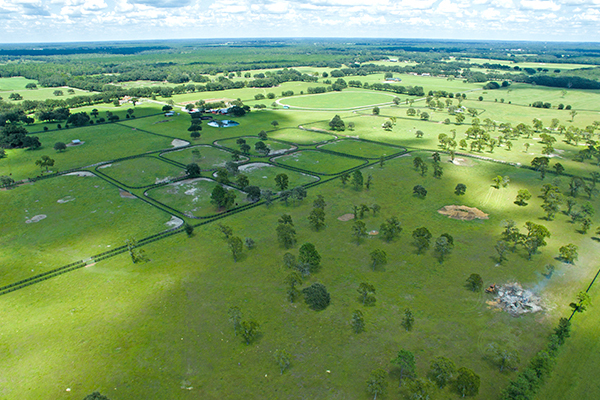 Contact us to discover all that this gorgeous acreage in Central Florida horse country has to offer! 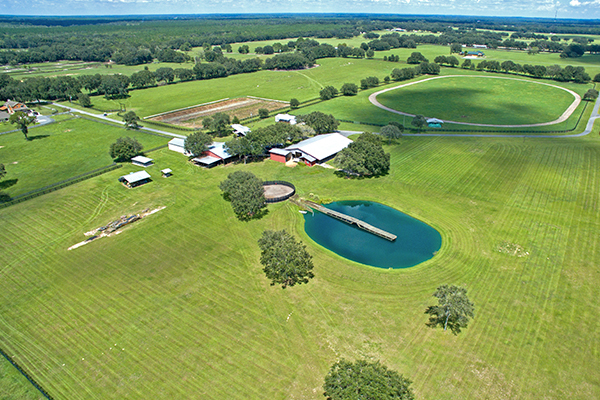 In the middle of Central Florida’s Horse Country, these 40 beautiful acres are stunning. The 4,435 sq.ft. 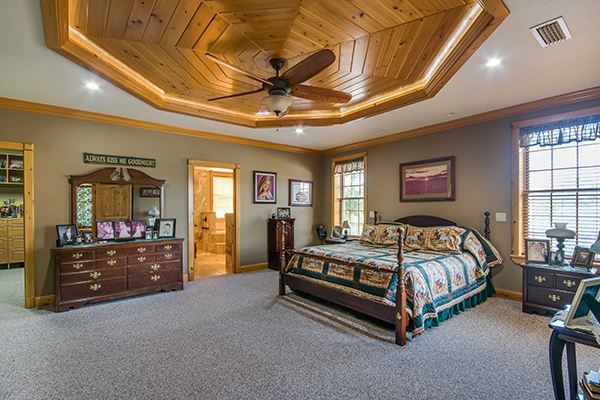 main home offers 5-bedrooms, 4-baths, with a country-style metal roof. Heartwood pine flooring is featured throughout, and the chef’s kitchen includes stainless appliances, expansive granite counters, and wrap-around conversation bar. Adjoining the home is a 13-foot deep saltwater pool with pools house.